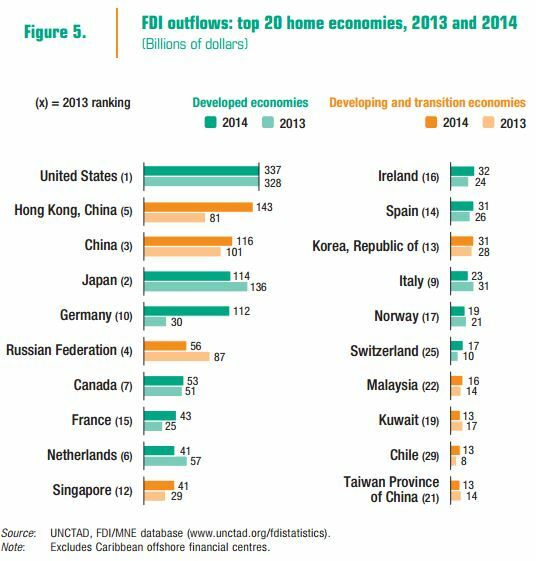 Global foreign direct investment (FDI) inflows fell by 16 per cent in 2014 to $1.23 trillion, down from $1.47 trillion in 2013 (figure 1). This is mostly explained by the fragility of the global economy, policy uncertainty for investors and elevated geopolitical risks. New investments were also offset by some large divestments. 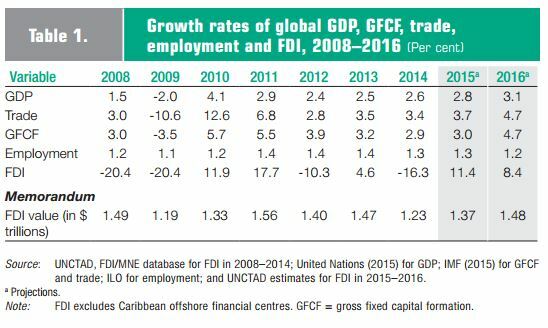 The decline in FDI flows was in contrast to macroeconomic variables such as GDP, trade, gross fixed capital formation and employment, which all grew (table 1). Although the outlook for FDI remains uncertain, an upturn in FDI flows is anticipated in 2015. Strengthening economic growth in developed economies, the demand-stimulating effects of lower oil prices and accommodating monetary policy, and continued investment liberalization and promotion measures could favourably affect FDI flows. 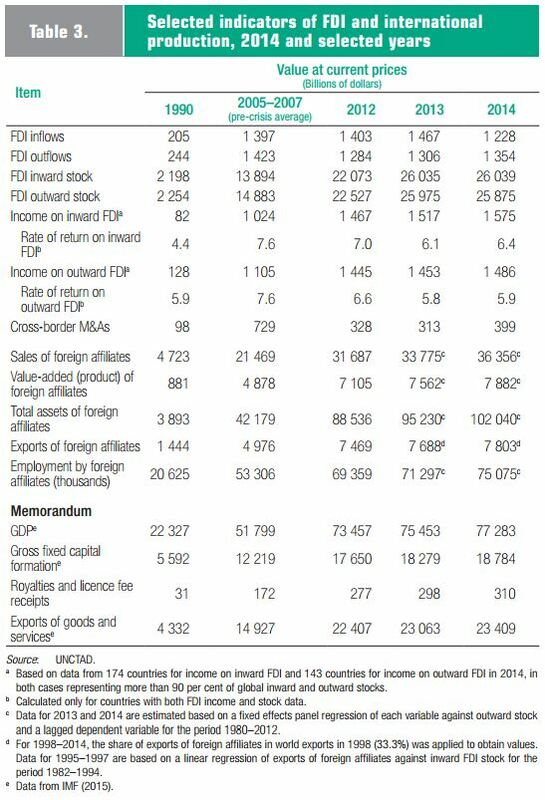 Both UNCTAD’s FDI forecast model and its business survey of large MNEs show a rise of FDI flows in and after 2015. 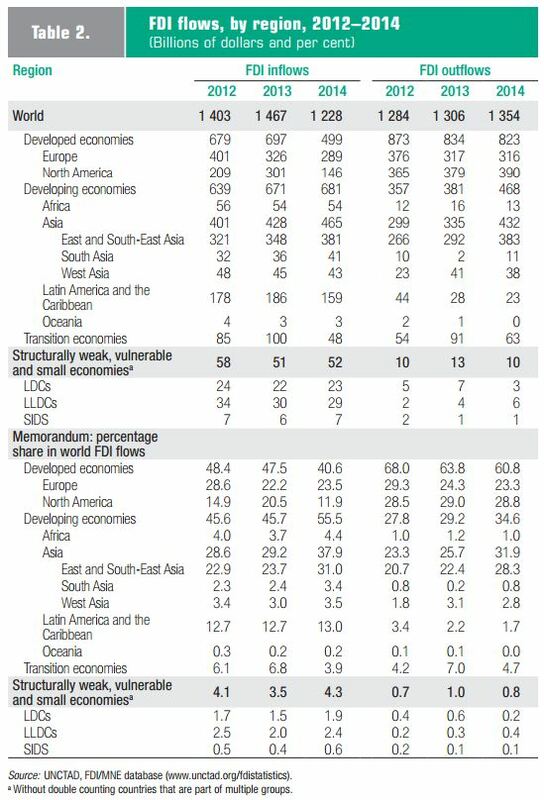 Developing-economy inflows reached $681 billion (table 2). This group now accounts for 55 per cent of global FDI inflows. Five of the top 10 FDI hosts are now developing economies (figure 2). However, the increase in developing-country inflows is primarily a developing Asia story. FDI inflows to that region grew by 9 per cent to almost $465 billion, more than two thirds of the total for developing economies. This rise was visible in all subregions except West Asia, where inflows declined for the sixth consecutive year, in part because of a further deterioration in the regional security situation. FDI flows to Africa remained unchanged at $54 billion, as the drop of flows to North Africa was offset by a rise in SubSaharan Africa. Inflows to Latin America and the Caribbean saw a 14 per cent decline to $159 billion, after four consecutive increases. The Russian Federation dropped from 5th to 16th place as a recipient country, largely accounting for the 52 per cent decline in transition-economy FDI inflows to $48 billion. Despite a revival of cross-border merger and acquisitions (M&As), FDI flows to developed economies declined by 28 per cent to $499 billion. FDI inflows to the United States fell to $92 billion, significantly affected by a single large-scale divestment, without which the level of investment would have remained stable. FDI flows to Europe fell by 11 per cent to $289 billion, one third of their 2007 peak. 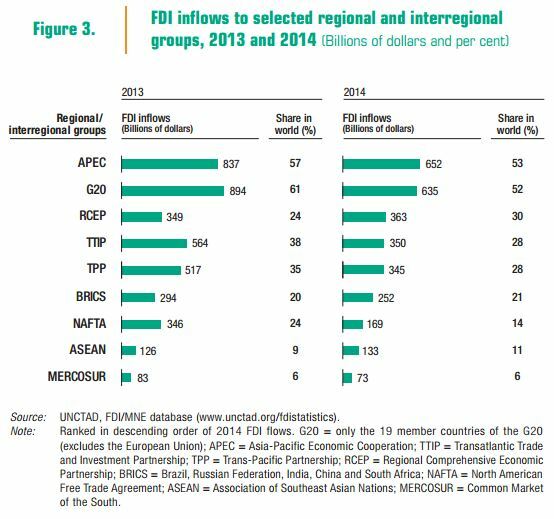 The decline in global FDI flows also affected FDI to regional economic groups in 2014. For example, the groups of countries negotiating the Transatlantic Trade and Investment Partnership (TTIP) and the Trans-Pacific Partnership (TPP) saw their respective shares of global FDI inflows decline (figure 3). Two Asian groups – ASEAN (up 5 per cent to $133 billion) and RCEP (up 4 per cent to $363 billion) – bucked the trend. Longer-term efforts will, for the most part, lead to increased FDI in regional groups by opening up sectors to investment and aligning policies for the treatment of investors. In 2014, MNEs from developing economies invested almost $468 billion abroad, a 23 per cent increase from the previous year. 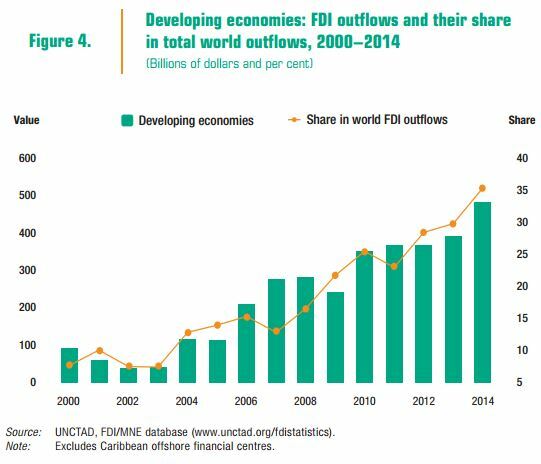 Developing economies now account for more than one third of global FDI outflows, up from 13 per cent in 2007 (figure 4). Developing and transition economies represent 9 of the 20 largest investor economies globally (figure 5). 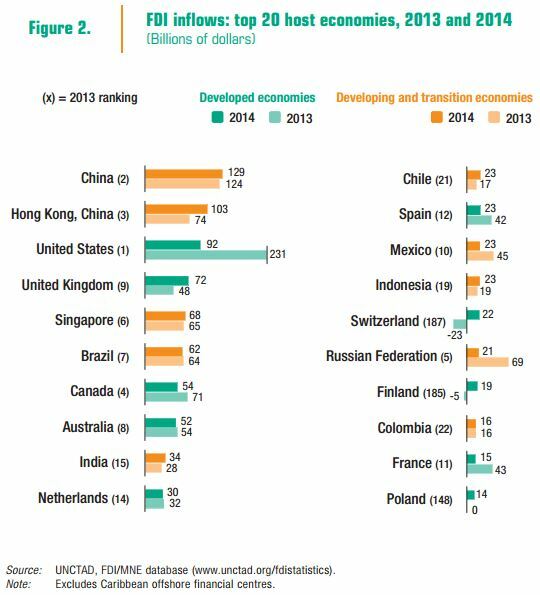 Outward FDI stock from developing economies to other developing economies countries grew by two-thirds from $1.7 trillion in 2009 to $2.9 trillion in 2013. East Asia and South-East Asia were the largest recipient developing regions. The share of the poorest developing regions in SouthSouth FDI is still low, but it is growing. Much developing-economy FDI goes to each economy’s immediate geographic region. Familiarity eases a company’s early internationalization drive, and regional markets and value chains are a key driver. Specific patterns of South-South FDI are also determined by MNE investment motives, home government policies and historical connections. Developed- and developing-economy FDI outflows differ in their composition: while more than half of developing-country MNE outflows are in equity investment, developed-country outflows have a larger reinvested earnings component (now at 81 per cent) (figure 6). Equity outflows are more likely to result in new productive investment; reinvested earnings may also translate into increased cash holding. After two consecutive years of decline, cross-border M&A activity picked up in 2014. In net terms, the value of cross-border M&As increased by 28 per cent, reaching $399 billion, facilitated by the availability of cheap debt coupled with considerable MNE cash reserves. Competitive pressure to find new pockets of growth and the need to cut costs through synergies and economies of scale were important deal drivers. The re-emergence of large deals was a key factor in the increase in the value of cross-border deal activity. In 2014 the number of MNE acquisitions with values larger than $1 billion jumped to 223, from 168 in 2013. At the same time, MNEs have made significant divestments, equivalent to half of the total value of acquisitions. Announced greenfield investment remained sluggish, decreasing by 2 per cent to $696 billion. 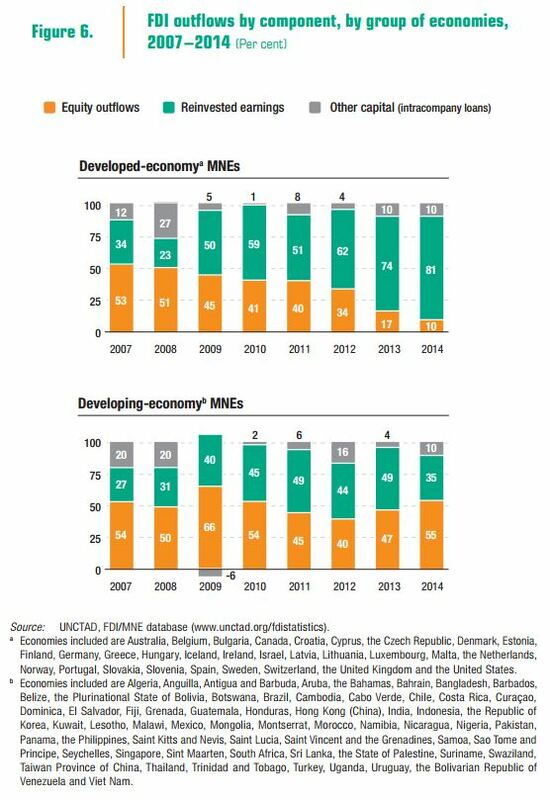 Greenfield investment by developed-country MNEs rose marginally, while that by developing-country and transition-economy MNEs declined. Nevertheless, developing countries accounted for 30 per cent of total announced cross-border greenfield investments in 2014. 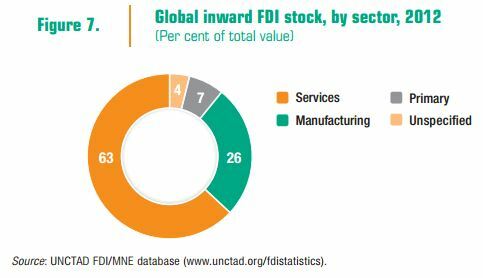 In 2012, the latest year for which data are available, services accounted for 63 per cent of global FDI stock, almost two and a half times the share of manufacturing (26 per cent), and nine times the share of the primary sector (7 per cent) (figure 7). 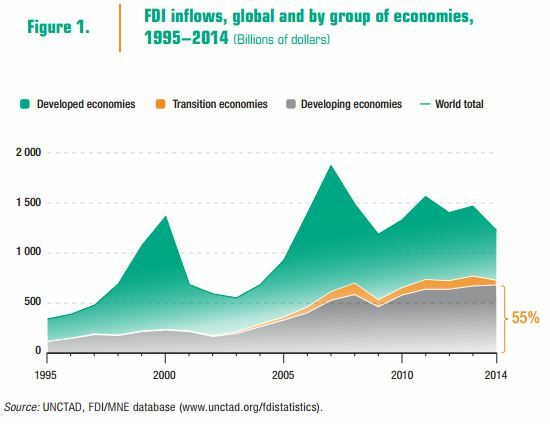 This share was up from 58 per cent in 2001, continuing a longer-term relative shift of global FDI towards services. Inasmuch as services account for 70 per cent of global value added, in principle the share of services FDI in global FDI could rise further. Beyond secular trends in the structure of the world economy, a number of factors are behind the increase in the level and share of services FDI. These include increasing liberalization in the services sector in host economies; technological developments in information and communication technology that make services more tradable; and the rise of global value chains, which has given an impulse to the internationalization of services related to manufacturing. In 2014, cross-border gross M&As by private equity funds rose to $200 billion. This amounted to about 17 per cent of the global M&A total, but was down 6 percentage points from the level in 2013, and 13 percentage points lower than in 2008. The upward trend in the value of private equity investments is likely to continue as a result of several factors: cash and commitments from investors are particularly high, estimated at about $360 billion; low interest rates in developed countries are making leveraged debt more attractive; and volatile global financial markets are expected to generate more cross-border investment opportunities. North America and Europe continued to be the major target regions for cross-border M&As by private equity funds, although Asia reached a historically high share in total private equity deals in 2014. There are more than 100 sovereign wealth funds (SWFs), managing over $7 trillion worth of assets and accounting for about one tenth of the world’s total assets under management, but FDI constitutes only a small proportion of those assets. The value of FDI by SWFs rose in 2014 to $16 billion, ending a three-year decline. Some SWFs have been engaging in long-term investments through FDI, including through crossborder corporate acquisitions and overseas real estate purchases. More than half of SWFs have started or expanded FDI in infrastructure, which represents an important asset class for them, because of both the sector’s large-scale investment opportunities and its relatively stable returns. In contrast, investment by State-owned MNEs (SO-MNEs) fell: cross-border M&As and greenfield projects in 2014 declined, by 39 and 18 per cent, respectively, to their lowest levels since the outbreak of the global financial crisis. The retreat of SO-MNEs is partly related to strategic decisions, such as the decision by a number of developed-country companies to consolidate their assets in some economies while selling them off in others. Policy factors have also affected SO-MNE internationalization; for example, stricter control of foreign ownership in extractive industries. International production by MNEs’ foreign affiliates expanded in 2014. Sales and value added rose by 7.6 per cent and 4.2 per cent, respectively. Employment of foreign affiliates reached 75 million (table 3). The financial performance of foreign affiliates in host economies improved, with the rate of return on inward FDI rising from 6.1 per cent in 2013 to 6.4 per cent in 2014. However, this level is still lower than that in the pre-crisis average (2005-2007). 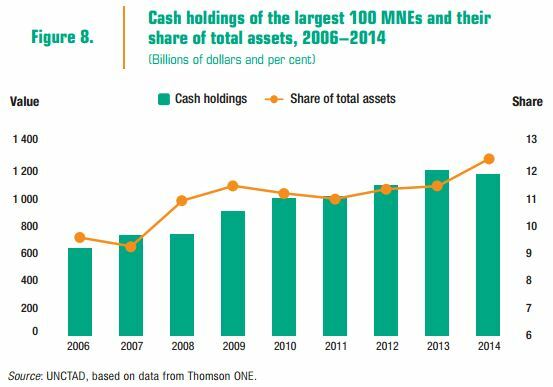 At the end of 2014, some 5,000 MNEs had an estimated $4.4 trillion in cash holdings, 40 per cent more than during the 2008–2009 crisis. However, there are signs that the largest 100 MNEs and companies in specific industries (e.g. utilities) are beginning to reduce their cash reserves (figure 8). In the last two years, MNEs in some industries (e.g. oil and gas, and utilities industries) have started to use cash holdings for more capital expenditures and acquisitions.